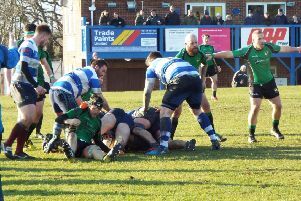 Hastings & Bexhill Rugby Club took a big step towards safety with a vital derby victory on Saturday. H&B moved seven points above the London Three South East relegation places with two games remaining following a hard-fought but well-deserved 32-7 win at home to Lewes. The two sets of forwards battle for supremacy at a scrum. H&B fielded a team showing several enforced changes of personnel and position in a match which started with both teams struggling for control. The home side opened the scoring with a well-taken penalty from Tom Waring and Ryan Foord increased the lead with a try which the centre converted. Flying winger Tim Sills added to his season’s tally with another well-made try. Stash Maltby, standing in at scrum-half, was distributing well to the back line and they made several penetrating runs into the Lewes defence. Lewes reduced their deficit with a well-executed and converted try of their own. Hastings & Bexhill try to break clear of the Lewes defence. The visitors played well and caused the home defence some problems, but great tackles from Chaz Ackerley, Jack James and Frazer McManus saved the day for H&B. Adam Baker, making a welcome return from university, scored a great try with a brilliant solo effort, but injured his shoulder in the process and had to be replaced by Joe Field. Baker’s try was converted, making the half time score 22-7. The second half continued in much the same vein. H&B were in control of the game and although not coasting, they were never in real danger of losing. Calvin Crosby-Clarke scored the all-important bonus point fourth try which Waring converted. H&B winger Tim Sills is tackled by two Lewes opponents. Steve McManus was sin-binned, which brought Anthony Roche, who had previously been replaced by Jacob McDonough in the front row, back into the fray. Waring completed the scoring with another penalty right at the end.